ANYANG, KOREA, December 22, 2017 /24-7PressRelease/ — Digital contents specialized manufacturing company, ‘D&P corporation’ launches ‘Augmented Reality Poster’ on Dec. 25th. 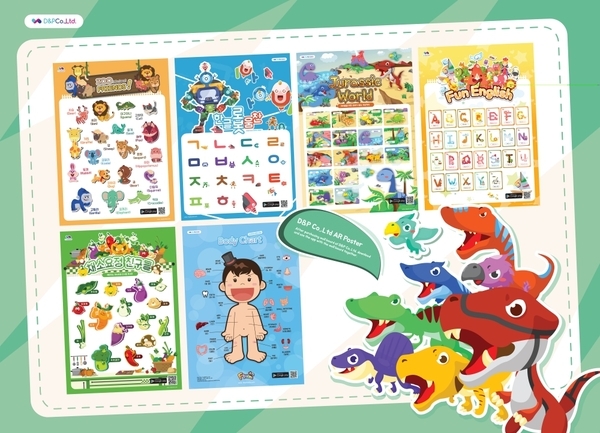 ‘Augmented Reality applied poster for learning’ of D&P Corporation, that is receiving great attractions from the publishers and consumers is the contents that have applied digital technology to flat poster. This is the new type product that did not exist in the former poster for learning, which have used interactive technologies. The objects moves when the user touches the device, and it is a system that they can do simple learning mini games and others. Since it has applied interactive electronic book technology to the augmented reality realizing technology, there is a advantages that user can interact with the contents easily. The augmented reality learning poster is classified into ‘observational type’, ‘spatial type’ and ‘360 degrees type’. The observational type augmented reality learning poster is the contents that have used the general augmented reality, and it realizes new image over the poster image. The spatial type augmented reality learning poster, is the poster that allows you to touch and learn the virtual space’s objects such as zoo, Jurassic world, and Paris. The 360 degrees poster is the system that can use the poster by the user moving objects and menu to 360 degrees allocation. Recently, it have introduced sample contents in the children’s book fair in Shanghai, China, and the inquiries for only the sample is beyond expectations. It is receiving a lot of attractions, as a lot of companies such as Malaysia SASBADI SDN, Jilin Science and Technology Publisher, Thailand SYL, TUTTLE-MORI, have interests in distributions and contracts. Meanwhile, D&P Corporation, and the company that manufactures traditional paper book and digital contents together, it is focusing on the contents that augmented reality is combined, and is progressing the product production and system construction. Before, it have manufactured contents and distributed in various forms centered on the character ‘The lion King Gaby’, but now it have applied augmented reality and is in contract and consultation with Vietnam Panda Books, Indonesia M&C Grammedia, Thailand TUTTLE-MORI, China Yanbian Publishing Company. 10 types of world travel poster that have combined augmented reality poster, augmented reality science exploration that can experience elementary school’s science curricular, 10 types of augmented reality contents development for dementia, augmented reality applied tour platform development and word recognition image recognition contents will also be developed.